At Five Lions Heating & Cooling, we service your boiler all year round. We are located in the east end of Scarborough and the GTA. We Service throughout the east of the city in Pickering, Ajax, Whitby, and GTA areas . 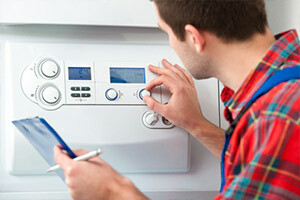 A boiler is one of the most expensive and essential pieces of equipment in your home. To keep the boiler working safely all year round, it is important that you have it serviced regularly. Safety: Regular maintenance will help avert any such incidences like leaks which may occur. Keep your family and home safe. Energy efficiency: Regular servicing is also a great way of ensuring that your boiler uses energy in the most efficient manner and does not hike your energy bill. Boiler cover claims: Importantly, even if you have a boiler cover, the home insurance company will require boiler service records to honor your boiler repair claim. Here are a few simple measures that will keep your boiler in good working condition. Regular testing: When the boiler is not in use, check your boiler every couple of months by running it for 10 -15 minutes. Call a qualified Five Lions technician: Boilers are complicated and dangerous pieces of equipment. We will advise you on to repair minor problems, instead of trying to do it yourself. It is safer for both you and the boiler. Install a carbon monoxide alarm: When boiler fuel does not burn properly, it produces carbon monoxide. Since carbon monoxide is an odourless gas, it is advisable you install an audible alarm to detect any leaks. Doing so will protect your family from potentially fatal carbon monoxide poisoning. Incidentally, as per law, it is the responsibility of the property owner to ensure that all gas appliances installed in the house, including boilers, are working properly. We make sure that your boiler and all your appliances are in functioning order. Five Lions Heating & Cooling is a full service company that you can count on to service your boiler in repairs, new installations and maintenance plans. We are dedicated and reliable. We are knowledgeable with our products and keeping up with technical standards is a priority and to ensure safety. Call on a professional to service your boiler needs! We are available 24/7 when you need us.We service GTA areas.